I was surfing around looking for stamps when I came across this collection on a stamp auction site www.sandafayre.com. 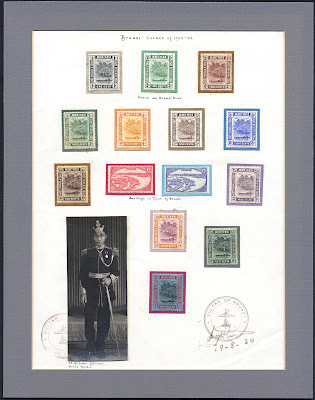 The stamps are common 1924 variety, nothing much to talk about but what's intriguing is that the photo had the stamp of Sultan of Brunei and it is signed too. I have never seen Sultan Ahmad Tajuddin's signature so I cannot verify whether that is his signature. But if you are thinking of joining the auction, the guide price is around $1,200. I will just watch. Brunei only have its first stamps in 1895 when a Robertson persuaded the Sultan that he is able to run a postal system for Brunei. He makes money for the stamps sold outside Brunei but the government keeps the money for stamp sales in Brunei. Unfortunately his postal system has been described as sporadic and by 1902/03, was basically no longer functioning. Brunei's first official postal system was in 1906 when the British Resident came into Brunei for the first time. What happened to people who wanted to send letters before 1895 and in between 1895 and 1906 when the postal system was sporadic? They have a choice of asking nicely whoever is going to Labuan or they go to Brooketon (now Muara) and used Sarawak stamps. Brooketon until 1921 was run by the Brooke family because they bought the coalmine concession. 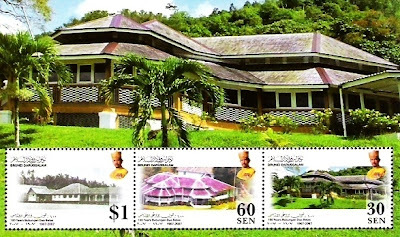 Brooketon was run as a state within a state - it was run as part of Sarawak and Sarawak stamps were used extensively. 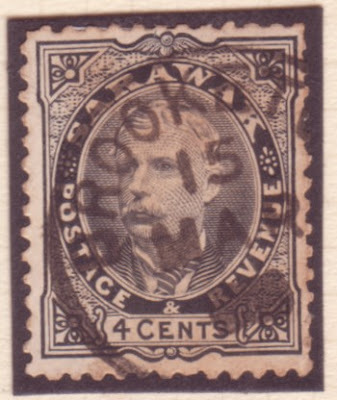 Above is one Sarawak stamp handstamped with Brooketon postmarked - proof that Brooketon for a few years was treated as a 'colony' of Sarawak. I managed to win the bidding for this currency the other day. I can't remember how much this one cost - in the region of at least US$50. This $1 note bears the portrait of Sir Charles Vyner Brooke, the last of the Rajah Brooke who governed Sarawak. This $1 note circulated in Brunei as well as in Sarawak. I have not found anyone who can tell me whether it is accepted as it is or whether it circulated at a discount. 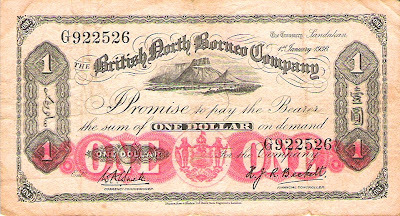 In the 1930s, Brunei was using the straits dollar. This $500 polymer note was issued sometime last year to replace the old paper note. Many Bruneians did not realise it but then not that many people deal with $500 note, so you can't blame them. My mother was one and she kept hers as she thought this was a very special note. I told her it was just the normal note and if she wants to keep it, it's okay but then she can get one anytime as this is a normal circulation note. I saw it being sold on ebay with a 25% to 40% premium. The most unusual thing about this issue is that it does not have the potrait of the reigning Sultan. His Majesty Sultan Haji Hassanal Bolkiah Muizzaddin Waddaulah wanted to honour and remember his father and hence the potrait of his father on this new $500 note. 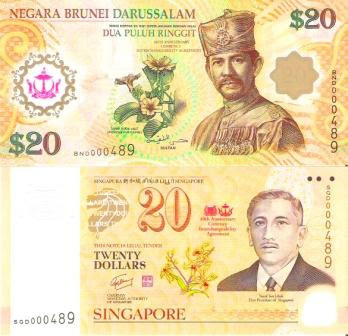 The last time, Sultan Haji Omar Ali Saifuddien Saadul Khairi Waddien appeared on the Brunei notes was in 1967 and that was replaced in 1972. That time too, the 1967 series only go from $1, $5, $10, $50 and $100. I guess this new $500 note can be an extension of the 1967 series. A couple of days ago, the Post Office issued the latest stamps and first day cover. This time to commemorate the 100 years of Bubungan Duabelas. Bubungan Duabelas is the oldest building in Brunei today and used to be official residence of the British Resident (based in Brunei beginning 1906) and in the mid 1950s, the official residence of the British High Commissioner. The British surrendered the house to Brunei Government sometime in the 1980s and today it is maintained by the Ministry of Culture, Youth and Sports to become an exhibition hall. The interesting thing about the stamps is that the old house on the $1 stamp is not that of Bubungan Duabelas. I am not sure whether it is deliberate of the Post Office or pure ignorance on their part. The house on the $1 stamp is that of the British Counsul General's and was actually built in the late 1890s at the foot of the hill and is actually on water. It was in 1907 that the Bubungan Duabelas was built further up the hill. The site for the Bubungan Duabelas used to site another old house built by the British Counsul General as far back as the 1850s. 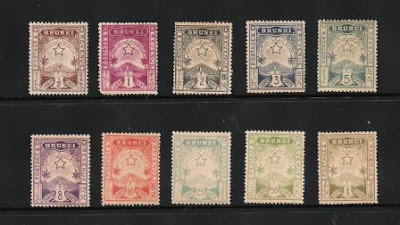 These are Brunei's first postage stamps issued in 1895. I managed to get my hand on the full set recently at about $150. The catalogue price is about $220. However these are unused so they are worth less. A full set of used ones will be worth twice as much. Unfortunately my used one is only half a set and I am still building up that one though it is much harder as there are very few of these stamps which came up on the market. There is a nice story about these stamps but I will wait until the article I wrote about it (it's in the queue) gets posted on my other sites and will link up to it. How many people remember this $25 bank note? This was issued in October 1992 to commemorate the Silver Jubilee (25 years) of His Majesty's Ascension to the Throne. In October 1967, His Majesty Sultan Haji Omar Ali Saifuddien Saadul Khairi Waddien abdicated and His Majesty Sultan Haji Hassanal Bolkiah Muizzaddin Waddaulah became the 29th Sultan of Brunei. Every October would be the anniversary of His Majesty Sultan Haji Hassanal Bolkiah ascending to the throne (or in Malay, naik takhta). This coming October would be the 40th Anniversary. There has been a lot of talk about having a celebration, but officially I have not heard of any. Incidentally, His Majesty's Coronation was not held until August 1968. So sometimes, the anniversary of the Coronation is celebrated. There was one stamp and first day cover issue which celebrated the Coronation in 1968. Technically we can have the ceremony at some other time other than October if the palace so wished. My father gave me this bank note the other day. I looked at the obverse of the note and realised that this note is aimed at not making itself known with one look. The letterings or alphabets are unusual and I was quite surprised that this particular country had its own way of writing - its own alphabets. Another oddity is that this note belong to a Muslim country as the dates are both in the normal Gregorian calendar and a Lunar Muslim calendar. You have to turn the note over before realising that this is issued by the Maldives Monetary Authority. My father got this note and the remaining lower denomination values as he was both the Brunei High Commissioner to Singapore and also the High Commissioner to Maldives even though Maldives and Singapore are not exactly neighbours - separated by several thousand miles apart. The influence of the British is quite apparent in the colour of the note. Blue is the British colour for $50 and the same colour appeared in many other British colonies' currency notes. His Majesty Sultan Haji Hassanal Bolkiah Muizzaddin Waddaulah celebrated his 61st Birthday yesterday. His Majesty ascended the throne when his father His Majesty Sultan Haji Omar Ali Saiffuddien Saadul Khairi Waddien abdicated on 5th October 1967 but his coronation was not until 1st August 1968. So on the 15th July 1968, His Majesty Sultan Haji Hassanal Bolkiah had been the Ruler of Brunei for about 9 months. On that day, the first stamps to celebrate the birthday of any ruler of Brunei ever were released. These stamps came from the first day cover and unfortunately the stamps are not in that good condition. Interestingly enough in the space of about 3 weeks, three diferent sets of stamps were released. The first was a delayed release to commermorate of His Majesty being annointed as Duli Pengiran Temenggong on 9th July 1968. On the 15th was the release up there and on 1st August 1968, the release of the postage stamps to celebrae His Majesty's Coronation. Technical Notes: Stamps Watermark Block CA Sideways, P.12. Designer - V Whiteley and Lithography by De La Rue & Co. Between 1906 and 1938, anything goes in the Brunei's economy. We were accepting all sorts of currencies issued by the Straits Settlement Government based in Singapore as well as those issued by the Rajah Brooke's of Sarawak and the Governor of the North Borneo Company in Sabah. 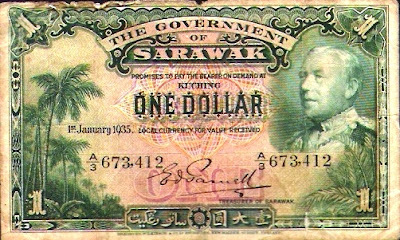 Here is one of the currency notes from North Borneo which at that time, its treasury was not in Kota Kinabalu but in Sandakan. On 27th June 2007, when His Majesty Sultan Hassanal Bolkiah Muizzaddin Waddaulah, Sultan and Yang Di-Pertuan of Brunei Darussalam exchanged the currency note of Brunei with His Excellency Mr Lee Hsien Loong, the Prime Minister of Singapore, the currency note of Singapore - that occassion marked the 40th anniversary of the currency interchangeability agreement between Brunei and Singapore. For 40 years now, citizens of the two countries are able to use each other's currency in both countries. No other countries in the world has such an agreement. 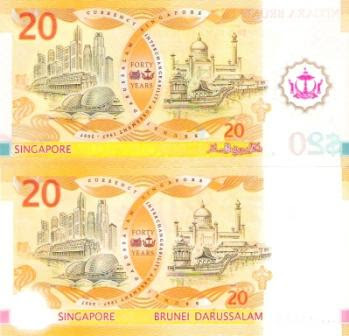 To commemorate the anniversary both the Brunei Currency and Monetary Board and the Monetary Authority of Singapore issued both country's versions of $20 polymer notes sharing a common reverse side. Both countries also issued both circulation and anniversary versions. The anniversary versions are sold in a pair of both Singapore and Brunei notes in a pack sharing a common number as well as added words on the notes stating the 40th Anniversary Currency Interchangeabililty Agreement. On the Singapore note, both countries' crests appeared on the note as well. The two $20 notes are said to make up 40 years anniversary and a total of 12,000 sets were sold. It was reported that the set that contained the no. 1 was auctioned for about $100,000 even though the set was only sold for $88. Parents sometimes are the oddest of creatures. I didn't know my parents had a stash of currency notes until I started telling them about my currency notes collection recently. So last Friday when I dropped in, my mother gave me a whole bundle of notes from many places - some from places where my father used to be posted as an ambassador including Maldives. Not many people have been to Maldives or collected Maldives currencies. My mother also gave me a gem of a coin going back all the way to 1897. 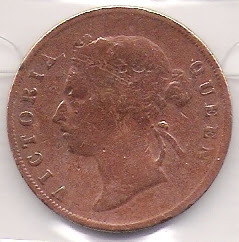 This is the coin used in the Straits Settlement (Malaya and Singapore but also Brunei) - a one cent with Queen Victoria on the obverse. Below is the scan of that coin. She gave me a number of other British coins but I thought I will tell you about those in other postings. Is that 1897 coin, the oldest in my coin collection? No, I have an 1886 Brunei coin, a 1794 Dutch East Indies coin and another unidentifiable year Brunei coin which is around the 17th and 18th century too. Anyway, those are for future postings. There is not much to tell about this coin as I don't have much info about it. All I know is that Queen Victoria is probably one of the longest reigning British monarch from 1837 to 1901. So there is a number of coins in the 19th century with her features on it especially that century coincided with the British Empires expansion and the Industrial Revolution. 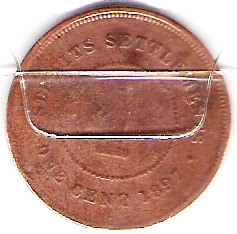 Today I leave you with the scan of the 1897 one cent coin that used to circulate in Brunei too in those years. The 20th Southeast Asian Games was held in Brunei in 1999. Brunei had to be arm twisted to host it by the other ASEAN countries. Brunei was asked to host it in a meeting in 1996 and the next year Brunei officially confirmed that it was unable to do so. A couple of months later in the same year of 1997, the SEA Games Federation appealed to Brunei to host the 20th SEA Games as Malaysia had already rejected the offer as they would be hosting the 16th Commonwealth Games. Brunei agreed on the condition that it hold events that Brunei was capable of doing so and the SEA Games Federation agreed. By October 1997, Brunei made the announcement and at the end of the 19th SEA Games in Jakarta, Brunei accepted the flag and the rest is history. Am I revealing state secrets by describing the above events? Of course not. This was explained in the brochure that was included in the First Day Cover for the SEA Games. 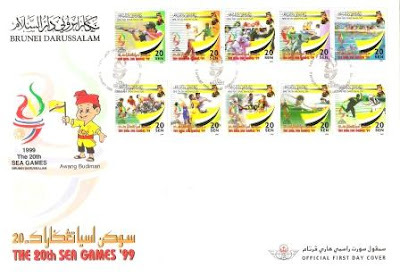 The FDC commemorated the issue of 10 different stamps when it was released on 7th August 1996. It was the biggest FDC in Brunei's postal history. This is the only FDC that I could not fit into the normal FDC albums. The writeups about the games in the brochure to the FDC was interesting and informative. I dropped into the Tamu. I did it a couple of days ago but the old lady selling the old currency notes were nowhere to be found. Today she was around. I dropped in as casual as I could look, pretending as if I wasn't interested in her currency notes. I don't think it worked. Anyway I started a casual conversation on her money and saw that she had a few notes mostly the old Japanese currency during the war (more popularly known as duit pisang - banana money). But she had 3 interesting notes - the $10 Queen Elizabeth (issued 1953), the $10 King George VI (1941) and the $10 Malaya Borneo (issued in 1961). The former two I have and the latter one I was still competing on ebay trying to get it. The latter one is the most scarce despite being the most recent of the three. I tried to bargain but she stood firm with the price of $230 which is slightly higher than on the net but at least I don't have to pay for shipping and insurance getting it from overseas. In the end I bought that. I also managed to get the duit bintang from her plus an older coin of around 17th or 18th century Brunei. It's one of the issues by an unidentifiable Sultan of Brunei. When I came back I found out that I have also won the same $10 - which completely surprised me at much cheaper than I thought and I might win another two auctions as I have already raised my max bids on both. In two weeks time I will have 4 pieces of this $10. I have to start selling on ebay too! The following is that hard to get $10 note. 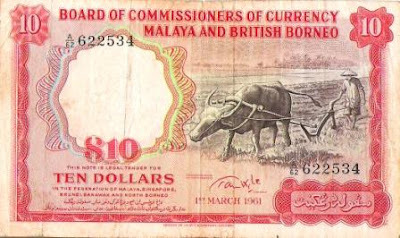 It was issued in 1961 by the Malaya and British Borneo Board of Currency Commissioners and popularly known as Duit Kerabau because of the ox on the note. It replaced the $10 which had the face of Queen Elizabeth II issued in 1953. On the back, it also had the crest of Brunei as one of the co signers of the 1938 agreement for this board of currency. The colour red followed on from the 1941 issue of King George VI and remained red till today (look at your $10 note). I have been visiting the antique sellers here in Bandar Seri Begawan. I know there is an old lady at the Tamu selling old things plus old money. Unfortunately when I went there last Monday, she was not there. So I thought I will drop in at the Bandaran Complex (aka Parking Bertingkat) and I found one shop somewhere round the back. But the old man who owned the shop was very surly and clearly does not believe in customers. However his shop is a real treasure trove and he sells among other the Duit Bintang (Star Coin) issused by Sultan Hashim sometime in 1886. That particular coin was controversial when it was issued, I will write about that sometime in the future. How did the colour of the notes come about? In the past, Brunei's money were made up of many things, other than just coins issued by the various Sultans but also coins of the other other countries of which coins from the Chinese Empire made up the bulk of it. We also used among others shells, strips of irons and even small cannons. However by the mid 19th century, Brunei started to use the coinage of Queen Victoria (dated 1845) which was the currency of the Straits Settlements. Also used at that time was the coinage and paper money of Sabah and Sarawak. The paper money and coins of the Board of Commissioners of Currency, Malaya were used before the Second World War. And of course during the Japanese occupation, Brunei used the famous 'duit pisang' which was the currency issued by the Japanese government. On 1st January 1952, the currency of the Board of Commissioners of Currency, Malaya was reconstituted as the Board of Commissioners of Currency, Malaya and British Borneo. This is when you see the original colours of blue, green and red for the $1, $5 and $10 come in. Though the $50 and $100 notes were of slightly different colours and the denomination of $1,000 and $10,000 were also issued. New coins and notes bearing the portrait of Queen Elizabeth II were issued and continued to be made up to 1961. In 1959, the Board had issued new designs where the portrait of Queen Elizabeth was no longer used but the colours remained. Under the 1960 Malaya and British Borneo Currency Agreement, the Board was responsible in circulating the paper money and coinage in Malaysia and Brunei. In 1964, this agreement was terminated and the Board ceased to issue the currency to the banks and public on Saturday, 10th June 1967. The issuance of currencies were to be made by each country, in Brunei by the Brunei Currency Board, in Malaysia by Bank Negara Malaysia and and in Singapore by the Board of Commissioners of Currency, Singapore. On 12th June 1967, the Brunei Currency Board for the first time issued and circulated notes in denominations of $1, $5, $10, $50 and $100 in the original colours as the previous currencies of the Board of Commissioners of Currency, Malaya and British Borneo. In fact all three countries retained the same colours and maintained the same colours up to now. That's why when you hold the Malaysian notes or the Singapore notes, the colours looked quite familiar even though there are slight variations. It was the original 1952 Board which influenced what our money looked like today. On 22nd August 1967, Brunei Currency Board issued and circulated Brunei coins of 1 cent, 5 cents, 10 cents, 20 cents and 50 cents to the banks and public. The coins of the Board of Commissioners of Currency, Malaya and British Borneo were then withdrawn. On the obverse of the 1967 paper money and coinage is the portrait of the late Sultan Haji Omar Ali Saifuddien Sa'adul Khairi Waddien, the 28th Sultan of Brunei.